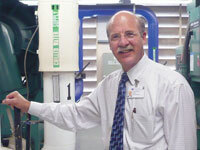 NorthBay Healthcare has won two prestigious Communitas Awards. The awards recognize exceptional businesses that are unselfishly giving of themselves and their resources, and those that are changing how they do business to benefit their communities. NorthBay Healthcare’s new cogeneration facilities—a green initiative led by Dave Mathews, director of plant operations and general services—won in the category of”Green Initiatives.” The cogeneration facilities are expected to save our hospitals millions in energy costs. Communitas Awards is an outgrowth of the pro bono recognition program of the Association of Marketing and Communication Professionals, which honors creative achievement and fosters partnerships with charities and community organizations.